This will be my last note as the 2015 GCSSEPM President. I'd like to say that it has been a great pleasure to work with such a wonderful and hardworking Executive Council and Board of Trustees. These individuals volunteer their time not only because they care about the health of the Section, but because they also have an inner drive to progress our understanding of Gulf Coast geology. Not only does this involve securing technically sound individuals to help direct our research conferences, but it also involves a myriad of other moving parts like student involvement, inter-societal gatherings, conference organization and logistics and research grants to name a few! We all want the best for the Section because it has been such a major focus point for technical research presentations and papers over the years and will most certainly continue into the future. Since my last column, the industry continues to poke along in the doldrums, but it appears there may have been some stabilization as of the last few weeks. Granted a number of companies and employees have experienced upwards of two or even three layoff cycles this year alone, oil price seems to have stabilized somewhat lately. Hopefully this is a positive sign that we're turning the corner! And, by turning the corner, I mean we can all get back to work as usual, especially for those disrupted by staffing and organizational changes. Students should not be discouraged by the current climate, rather this should be a learning experience that we work in a volatile industry, and thus it is always important to stay on top of your game. Networking, volunteering and presenting technical work are just a few of the things that will help your professional career. For starters, and I will shamelessly promote the Section here, the GCSSEPM is a great place to get involved! Present your technical work at the upcoming Perkins-Rosen Research Conference and attend the upcoming short course! These are great avenues to network and get your name out there! Speaking of, the upcoming 2015 GCSSEPM Perkins-Rosen Research Conference themed "Petroleum Systems in 'Rift' Basins" will be held in Houston, Texas on December 13–16. A total of 42 technical abstracts have been accepted and we certainly look forward to a well-themed conference! The 2nd Annual Student Poster Competition will also be held during the conference. Students entering the competition will receive free admission to the conference, have their abstract published with the conference proceedings, will receive an invitation to the 1-day exploration-themed short course and have a chance to win prizes! We encourage all students to submit their abstracts...the deadline is November 6. Please see the advert in the newsletter for more details. Conference registration is now open. Please see www.gcssepm.org for details. Thanks again to all of the volunteers that comprise the Conference Committee, including the Technical Co-Conveners, Coordinator and Technical Program Committee. This conference would not happen without your hard work and efforts! I look forward to seeing everyone at the conference. The GCAGS/GCSSEPM Conference held recently in Houston, Texas was a huge success and big thanks go out to the organizers. The conference would not have been what it was without the dedicated time and efforts of Larry Bartell, Charles Sternbach, Linda Sternbach, Dorene West and numerous others, along with sponsorship by many more companies and individuals. Congratulations to all of the award recipients from both 2014 and 2015! I would like to take the opportunity to congratulate the newly elected GCSSEPM officers. Congratulations to John Suter, who will act as the 2016 President-Elect. John will be filling Dorene West's role as President-Elect and Dorene will be our new 2016 President. Also, congratulations to Jennifer Wadsworth, who won the election for Secretary. Jennifer will assume Charlotte Jolley's role as Secretary for the next two years. A big Thank You to Charlotte for all of your hard work and dedication over the years! You will be missed! It has been a pleasure serving on the Executive Council as President this year and I look forward to serving as Past-President during 2016. Big thanks go out to the current members of the Executive Council for all of their hard work and dedication: Dorene West, Sophie Warny, Brandi Sellepack, Charlotte Jolley and Carl Fiduk. I couldn't have done it without your help. I would also like to thank the GCSSEPM Board of Trustees for their guidance and patience during this year: Norm Rosen, Jory Pacht, Tony D'Agostino, Bruce Hart and Patricia Santogrossi. Thank you all for your time and dedication to the Section. All the best! I will conclude with an initiative that Past-President Carl Fiduk started in 2014. Each year, one Ed Picou Fellowship Grant awardee's research will be highlighted in our Fall Newsletter. 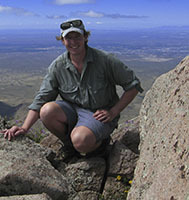 This year, Jason Sanford was chosen for the research highlight. Jason received GCSSEPM sponsorship for his research on the Chicxulub impact-derived Cretaceous-Paleogene boundary deposit (KPBD) in the Gulf of Mexico. Please have a look at his column in this newsletter for more information!